"Over the last year, I�ve taken more Giant Ibis night bus journeys than I care to admit. When I first moved to Cambodia, I vowed I would never take a night bus in Cambodia. Since then, I�ve made an exception for Giant Ibis because of their safety record and the many precautions they take to make sure each trip is a safe one. I�m now a regular on the Giant Ibis night bus from Phnom Penh to Siem Reap." For a number of shorter journeys, the air-conditioned (tourist) coach is the best option, as it's either not practical to do the journey by train and internal flight. For example the trip between Phnom Penh - Battambang or Sihanoukville. The buses depart/arrive close to the hotels we arrange in both places so it's very convenient. Short stops are made at restaurants along the way to allow you to stretch your legs, buy something to eat or drink and freshen up. Travelling by coach is relatively inexpensive, but can't be recommended for all parts of your journey. This is because the roads are not properly laid everywhere, and although short journeys are tolerable you wouldn't want to do lots of long ones. 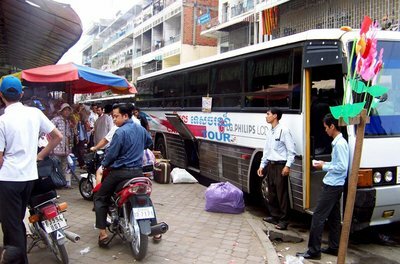 There are a few of bus companies providing transportation between Phnom Penh and the provinces that have better road and connect with Phnom Penh. All buses are air-conditioned and equipped with Video TV. The average travel speed of the buses is about 80 kilometres per hour. Bus stations are mostly located around Phsar Thmey (New Central market) area. For their latest schedule or exact departure time and price, you may contact them directly. The bus ticket from Phnom Penh to Siem Reap is about 5 dollars. 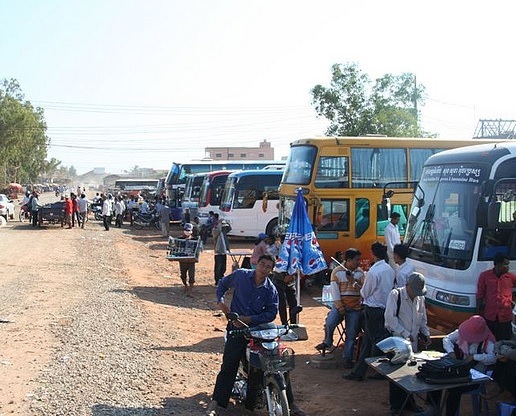 The bus travels on National Road 6A and then 6, via Kandal, Kampong Cham, and Kampong Thom provinces. Operated by all companies listed below. #87 Eoz, St. Sisowath Quay, Phnom Penh, Cambodia. Corner Street 217 and street 67, Phnom Penh 12209 Cambodia. #13 Street 142, Phnom Penh 12209 Cambodia. #14 Street 182, Phnom Penh 12258 Cambodia.